Please Tell us about your experience with DMI Collision. R U looking for a high quality Body Shop that you can trust? ..who would appreciate a free estimate and expert advice (without high pressure to buy) on what options are available to you? 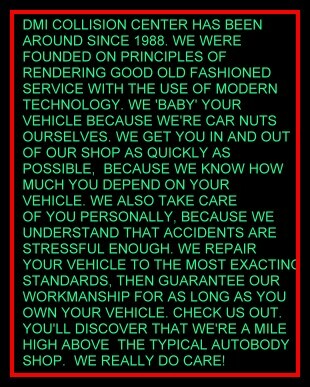 ..who would like regular updates on the status of your vehicle and realistic projections on how long repairs will take? ..who appreciates clarity and simplicity when discussing your vehicle's mechanical remedies/maladies? ..who is meticulous and demands exceptional service every time? Call us and let's discuss. We are passionate about serving our customers! � Lifetime warranty on our workmanship. Remember: An Insurance company can recommend a repair facility but ultimately It is YOUR choice, as to where to take your vehicle for restoration. Do your homework and choose a place that you can trust. We believe that DMI is one such place. We�d like to earn your trust. © Copyright 2018 DMICollision.com. All Rights Reserved.